In August 1985, Geno Auriemma was hired to be the head coach of the women’s basketball team at the University of Connecticut. Until then, the Huskies only had one winning season in school history. Since then, UConn has rattled off eight national championships and transformed the UConn program into the standard that all others are measured, both on and off the court. Auriemma was born in Montella, Italy, and didn’t become a U.S. citizen until 1994, despite immigrating to the States when he was seven. After graduating from West Chester University of Pennsylvania in 1977, Auriemma became an assistant coach at Saint Joseph’s. 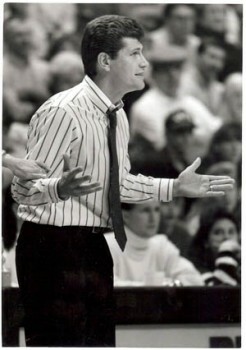 After two years off, Auriemma joined the University of Virginia in 1981 before settling into Storrs four years later. With Auriemma at the helm, the Huskies have been one of the most dominant women’s basketball teams in history. In his time with the Huskies, Auriemma has coached the likes of Rebecca Lobo, Jennifer Rizzotti, Kara Wolters, Sue Bird, Swin Cash and Diana Taurasi. Finishing a successful four year term as the head coach of the Women’s U.S. National Team, he won Gold at the 2012 Olympic Games in London. In 2006, Auriemma’s career was enshrined with his two inductions into the Naismith Memorial Basketball Hall of Fame and the Women’s Basketball Hall of Fame. In 2007, he was inducted into the National Italian American Sports Hall of Fame.